On March 29, minutes apart, Mary Kom and Sarita Devi fought in the quarterfinals of the Asian Oceanic Olympic Qualifiers. Mary Kom won her bouts convincingly. At 2 pm, it was announced that she was one victory away from qualifying for the Olympics. Her next match, the semi-finals, will be held on March 31. Less than an hour later, the fate of Sarita Devi's Olympic dreams - and 15 years of gruelling human labour - came down to a split decision. One judge ranked Devi as the better fighter in the women's semi-final in the Asian-Oceanic Olympic qualifiers. The two other judges declared Vietnam's Luu Duyen the winner. Devi was coming home. As the Indian contingent celebrated the victory of one, they still hold on to hopes for the other. It remains possible for Devi to qualify for the Olympics - 4 spots will remain open for the winners of the World Championships in Kazakhstan in May. Devi may compete for one of those four spots. It has to be said that winning at the World Championships is tougher than at the Asian-Oceanic qualifiers. It's an improbable chance, but a welcome one. Besides, in seventeen years of boxing, Devi has learnt a thing or two about making good use of second chances. Laishram Sarita Devi and Mary Kom started out as bosom friends. When they began as boxers sixteen years ago, they found an inevitable kinship. Both were from Manipur, of the same age, from farming families, struggling financially and deeply in love with boxing. Mary Kom did not tell her family she was a boxer; she famously scrimped on food to buy boxing gloves. She found in Sarita Devi a likeness - Devi was one of eight children of a widow with few resources. The two would train together. They would go on double dates with each other. When they visited one another's homes, they would work one another's fields. Devi recalls a time when, due to militant activities, Manipur was in lockdown. A curfew had been announced. A group of boxers, including Kom and Devi, were left stranded in the sports stadium in Imphal. There would be no going in or out. "There was no food. We were stranded inside the stadium for 15 days. We ate one meal a day - some rice and vegetables we could rummage up. Some days we fished in the pond inside the stadium. For fifteen days that's all we ate. But we still trained twice a day. Every day." And every day since, their paths have been intertwined in tense togetherness. 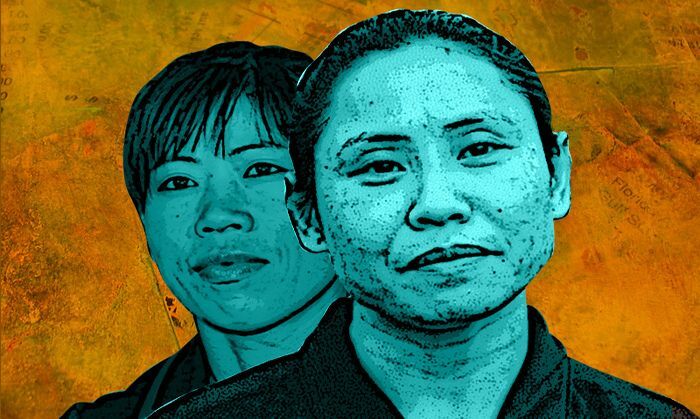 This month and the next, Laishram Sarita Devi and Mary Kom will together make their last attempt at Olympic gold. Kom will continue at the Asian Olympic qualifiers in Qian'an, China. If she loses, she will head to the World Championships for one last shot. Meanwhile, Devi will resume training for the world championships in May. Devi is in the 60-kilo category. Mary Kom at 51 kilos. They're both 33 years old. The Olympic age limit for women boxers is 35. By Tokyo 2020, they will have crossed that limit. Rio 2016 is their last. In 2001, long before she began boxing for India, Devi was taken by her coach, Chandra Lal, to a psychologist. It was a regular psychological assessment, intended to understand if she was going to be a good investment for the team. The psychologist's report was disheartening. Devi was psychologically less than ideal to become a competitive boxer. She was emotionally weak. She was too soft, too nice, too empathetic. She lacked the killer instinct and inherent aggression required to punch back twice for every time she was punched. She just wasn't an Alpha. This would not, however, mean that Devi would have to quit boxing. It is possible for sportspersons to overcome much graver psychological impediments. Monica Seles conquered trauma after she was stabbed by a Steffi Graf fan. She came back to win a grand slam. Lionel Messi overcame hormonal imbalances. Jonathan Trot suffered debilitating anxiety attacks, and pulled out of the Ashes. He has since made a comeback. Devi's failing was relatively less serious. It was anecdotally possible for Devi to beat her own softer instincts. But it would take double the human labour. She would have to work herself to the bone. She'd have to be faster, work longer, be fitter, train harder and teach her reflexes to attack. Where other boxers would fall back on brute instinct, Devi would always have to rely on impeccable technique. She needed all the strategic finesse and stamina she could get. And so she trained. Over the fifteen years of her career, she has become the fittest and most hardened boxer on the Indian team. She has the highest stamina and unprecedented technical skill. And she invests the longest hours in boxing of anyone in the Indian boxing contingent, male or female. In a documentary that released last month, her coach said, "Nobody on the team works 50% as hard as Sarita. Not even Mary Kom." And yet, perhaps because of her kinder instinct, Sarita Devi hasn't enjoyed the success that Mary Kom has. Devi has received the Arjuna Award in 2009, a slew of golds in Asian championships, and one gold at the World Women's Boxing Championship in 2006. She briefly entered national consciousness when she tried to return her bronze medal at the Asian Games in 2014. But compared to Kom's successes, hers are meagre. Kom has held the world record for winning the highest number of World Championships (2002, 2005, 2006, 2008, 2010) and one gold at the Asian Games in 2010. She's had a Hindi film made in her own name, starring Priyanka Chopra. She's featured in a reality television show about martial arts. And at the London Olympics 2012, she won the bronze in the 51-kilo category. Devi didn't even qualify for the Olympics. I ask Devi about it. The coach said you work twice as hard as Mary. How does that make you feel? Devi lies on the floor of the boxing ring, her arms being stretched backwards by her physiotherapist. She grimaces as the physiotherapist pushes a muscle. She doesn't respond at first, but begins to cry silent tears. Her hands are bound behind her. She can't wipe her tears away, so she lets them roll down her cheeks. Then she smiles. Devi is the only boxer in the world to have played in five different weight categories. 51 kilos, 52 kilos, 54 kilos, 57 kilos and 60 kilos. And not always by choice. Till 2009, Sarita Devi was happiest fighting in the 52-kilo category (light weight). She had won gold at the World Women's Boxing Championship in 2006 in that category. In those early years Kom, being four inches shorter than Devi, fought in the fly weight category (46 kilos). In 2006, both returned from the World Women's Boxing Championships with gold. One in 51 kilos, the other at 46. With both of them playing in separate categories, there was little competition. But that would soon change. In 2009, to much jubilation from boxers worldwide, it was announced that women's boxing would become an Olympic event. And because the Indian team, with Kom and Devi at the helm, was established as the best women's boxing team in the world, this was India's chance for Olympic glory. For Mary Kom, the solution was clear. If she wanted to compete, she would have to move up the weight chart and be her fighting fittest at 51 kilos. Devi, on the other hand, had a more complex question ahead. She could bring her weight down to 51 kilos and fight Mary Kom for a chance to compete in that category. Or she could move up to the 60-kilo category and fight with those larger and stronger than herself. She chose to fight Mary Kom for her place in the 51 kilo category. Two of Indian's strongest fighters were now vying to represent India in the same category. The selection judges for Asian Games, 2010 organized a selection match between Kom and Devi in August 2010, for the 51-kilo weight category. Devi won that match. The official announcement declaring Devi as the Indian representative was postponed till after the World Women's Championship. As soon as the team would be back from Barbados, where the World Championships were being held, the announcement would be made. For Kom and Devi, this time lag between the trial and the announcement would alter the course of their careers. Seemingly out of nowhere, while at the World Championships in Barbados, Kom declared that she was unhappy with the result of the selection. She demanded a retrial. Devi was shocked. It was a trial both had agreed to, both had partaken in, and one had been declared the winner. Kom was disrespecting both - the process and her friend - by dismissing the trial as unfair. Visibly shaken up by Kom's politicking, Devi underperformed at the World championships in Barbados. Devi's outrage in the face of this injustice had only worked to Kom's advantage. When the team returned to India - Kom having won the World Championships - a retrial was announced. Devi's morale was low, and she predictably lost the retrial. Kom was declared the Indian representative in the 51-kilo category. Devi now had no choice but to move up to the 60-kilo category, 8 kilos above her fighting best. So she did. With the carefully curated diet of her coach, she pushed up her weight to 60 and taught herself to fight with women stronger than herself. With an alien body and in an alien category, she worked harder than she ever had before. But when 2012 came around, she didn't qualify for the Olympics. It recently emerged that Kom had accused Devi of bribing team officials and "making friends" during the 2010 selections. Devi found out about this last month, six years after it happened, via a documentary about women's boxing in India. She was and remains hurt by Kom's allegations. "We shouldn't forget where we come from," are all the words she can muster about it. In fact, Devi is saying a lot. Because Kom and Devi, now neighbors in Imphal, come from the same place. In more ways than one. In 2011, Devi had the same psychological assessment performed on herself, ten years after the first. The results were the same. This time Devi wasn't surprised. She had seen her softness being used against her time and again. Outside and inside the ring. Did she ever want to change? Did she ever try to become more ruthless? I ask her husband, Chongtham Thoiba Singh, who is seated next to me while we watch Devi performing her thousandth stomach crunch. "Of course not. Why should she change the best part of herself? She must simply become a better boxer. And she has." Even removed from her differences with Kom, Devi hasn't had it easy. In 2014, she hit national headlines for trying to return her bronze medal at the Asian Games. She had emerged the better boxer at the end of her bouts, but the judges declared her the loser. At the prize-giving ceremony, Devi was seen sobbing and trying to return her bronze medal. The AIBA then banned her from competitive events for one year and fined her 1000 Swiss francs. But what was perceived, both by national media and by the AIBA, as insolence, was in fact a full-blown public emotional-breakdown. It later came to light that Devi had been fighting all her Asian Games bouts with a torn ligament in her left hand. She had received the injury while sparring during trainings. The doctors in India performed an X-ray, found no bone damage, and gave her the go-ahead for the tournament. But the pain persisted. A sports doctor in the games village then recommended an MRI. Devi, it turns out, had been training with a torn ligament. The doctor had advised her to skip the competition, but she persevered, taking five doses of painkillers every day. She reached the finals, but was fatigued - emotionally and physically. To compound her pain was this: Devi hasn't seen her infant son in months. He was being looked after by her joint family in Imphal, and was less than a year old. She was missing him desperately. When she was declared the loser to South Korean Park Ji-na, her husband - her harshest critic and her most stringent supporter - came out vocally protesting the judges decision, with a largesse of expletives. 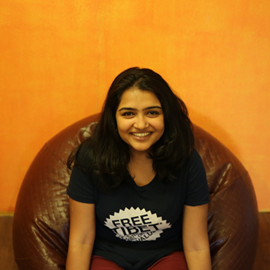 Devi lodged an official complaint. But a judges' decision, unlike a referee's, can never be overturned. It shouldn't be surprising then that when she was called onto the podium to accept her bronze, all the emotional defences she had kept rigorously in place for days came crumbling down. Few sportspersons survive such trauma and public flagellation. But in October 2015, at the end of her year-long ban, Sarita Devi returned to amateur boxing. For one last shot at the Olympics. I'm at Devi's last training session before the qualifiers. In the ring next to her own, Pooja Rani, the representative in the 75-kilo category, is training. Mary Kom is training privately in Pune. "Our son is a very good singer. He sings all day. He listens to Mohammad Rafi and Kishore Kumar and sings loudly," Thoiba, her husband, narrates, digging out his phone to show me a picture of the boy. The locked screen on his phone is a picture of Devi with Sachin Tendulkar (Tendulkar invited Devi to his home to express his support after the CWG debacle). Thoiba then opens up his gallery to reveal numerous photographs of the little boy - carefully collected for the many months neither parent is in Imphal. Devi pipes in, "He won't be a boxer. No boxing. He will be a singer." I glance quizzically, and Devi laughs. "I have to take 45 punches and give 50 in order to win. If I take 50 and give 45, I lose. It is our job to give and take punches. That is if you are lucky, can survive the politics and get a chance. My son will not do this." There's very little monetary reward as well. The reward for winning the World Championships, for example, is a handful of lakhs. For being the best in the world at anything, that's a pitiful sum. There is also very little state support - all dietary and medical expenses are still borne by the boxers. And given the degree of injury and the cost of dietary supplements - the women, even the very best, are left with close to nothing. Devi's physiotherapist looks up and grimaces. She mouths the word "nothing" and shakes her head. The two resume - the physiotherapist pulling on Devi's legs, and Devi wincing quietly. They cannot brood too much over the past, or worry too much about the future. If 17 years of labour are to amount to something, they have to think only of the next fight. READ NEXT >> Watch: what's the relevance of Bengali-dominated Barak Valley in Assam politics?